It had been a rough week for Angie Everglade. Monday’s job interview disaster with some young pup who seemed to equate rich life experience with imminent dementia. Wednesday’s OkCupid date with a man so full of himself she feared he might actually burst, splattering her new outfit with his ruptured innards. And now lab work that suggested a new incurable malady of which she already enjoyed several. After having a ripshit tantrum in the privacy of her own apartment, Angie pulled herself together. “I will not succumb to despair and self-pity, I will not succumb to despair and self-pity,” she mantra’d to herself over and over as she plied the grocery store aisles. Angie grabbed a few essentials for another dinner. At home. Alone. 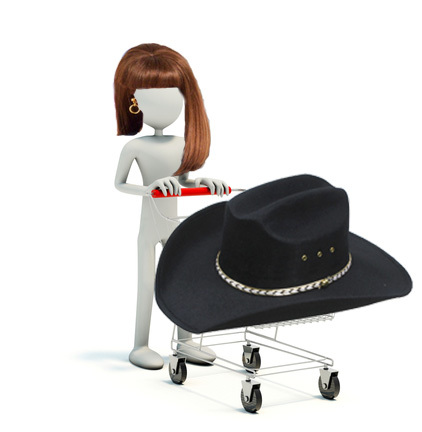 She was deciding between artisanal olive oils when, out of the corner of her eye she spied an item never before seen in a Berkeley Whole Foods: a real live genuine cowboy. Dude was every bit of 6 foot 6 in his black cowboy hat and boots, a breath-takingly handsome, broad shouldered achy-breaky wonder in his early 20s. The man was a freakin’ icon who shoulda been pushing open the doors of a saloon not a deli case. Angie nearly dropped her extra virgin. Now this, she said to herself, this needs to be on tonight’s menu. Angie plopped the olive oil into her basket. She’d long ago sworn off younger men after a series of torrid forays into cougar territory. Oh, she wouldn’t have missed those testosterone-addled affairs for anything. But after the base-jumper, the Occupy guy, the thrash-yet-melodic bass player, and the beat-box boy, her infatuation with the youth market was officially over. Angie was at last ready for a man who had the emotional maturity that only comes with age—if ever. With a deep sigh, our resolute heroine made her way to the express line. Placing her basket on the floor she fussed with the arugula. From her upside-down vantage point, she noticed that standing directly behind her were… oh god, those boots! Angie shot up and spun around. “Hi,” said the cowboy, cool as you please. “Uh, hi,” she stammered with all the poise of a star-struck teenager. Swiftly composing herself, Angie rallied her nerve and pointed to the unsheathed bowie knife strapped to his thigh. “My, my aren’t you a breath of fresh air?” Angie gushed, having somehow morphed into Scarlett O’Hara. Had Whole Foods been equipped with a fainting couch Angie would have swooned and cried out for smelling salts. “Next!” shouted the checkout clerk. Angie wobbled over to the register. “Find everything okay?” The checker, perfunctory. Surely I can afford a little indulgence, Angie rationalized. The checker rolled her eyes and rang him up. Watching the team of baggers gift-wrap her new plaything, Angie promised herself that this time would be different.